The performance by Solomon Riba at The Jazzy Rainbow on August 24, 2081, is part of the Concerts SA Venue Circuit which aims to foster a love and support for live music in communities, as well as anchor small and medium sized venues in urban and rural Gauteng, KwaZulu-Natal, and the Western Cape. 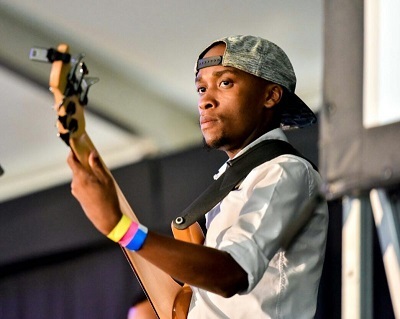 Solomon King Riba is an aspiring young bass player from Limpopo. He began his musical tuition in 2009 at the Music for Africa Trinity College London and is currently studying for his Bachelor degree at the University of KwaZulu-Natal, majoring in jazz and popular music. Riba has played with many people in the jazz and gospel industry- like Selaelo Selota, Solly Mahlangu, Chumani Ngojo & Nu Praize, Kgotso, William Sejake, Sibusiso Mashiloane and Dawn Thandeka King from SABC1’s telenovela Uzalo. Riba has been part of workshops, teaching youngsters jazz and the technique of improvisation in connection with iSupport Music Business. This show, his first headline show, is called 24 Years of Existence. He will be accompanied by Obakeng Thamage on piano, Freeman Gumede on bass, Lesedi Thloloe on drums, Kgethi Nkotsi on trombone and Sinalo Zulu on trumpet. His vocalists for the night are Andiswa Maduna (soprano), Nomthandazo Madiya (alto) and Sanele Khubisa (tenor). “I am very happy to present the music that has been in my heart all these years to the people. I will be playing my favourite jazz standards in the first set and my own compositions in the second set” says Riba. The Jazzy Rainbow is situated at 93 Smiso Nkwanyana Road, Morningside, Durban.